There are days where I need cards, look thru my stash and want something simple... something that doesn't really SAY anything at all. Well I didn't have that, so I had to put one together. 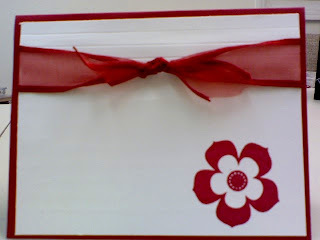 Its a simple card - white on red, which can be cheery or elegant, but you can make it anything you want. I didn't think I was going to put words on the front, nor did I want alot of embellishments. Simple.. remember simple! 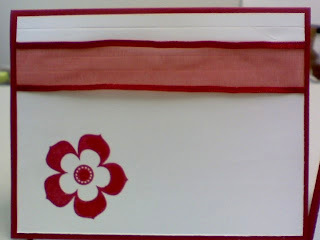 So I scored the top of the Whisper White card stock, tied my sheer ribbon to it, and then stamped just one bloom on it. And why make one, when you can make two very easily.